Sad and Lonely at the Holidays? You Are Not Alone. Recently a friend posted on Facebook urging others to remember that the holidays can be particularly difficult for people who have suffered loss. My dear friend lost both her parents in the last couple years and was explaining that she experiences those losses again and again over the holidays and around birthdays. She just wanted to remind everyone that the holiday season can feel particularly tender for her. I was not only struck by her emotional honesty, but also how deeply what she said resonated with me. While I have been making my peace with the season (see below), I have quietly discovered that on the actual holiday day, I usually feel a bit sad, a bit lonely, a bit disappointed, a bit like an outsider looking in. I use the word quietly on purpose here because I am not overcome by these feelings, but I am just quietly observing them and letting them have their say. In holidays past I used to let those feelings take up residency in my body from the day before Thanksgiving until well after the new year. Now I just watch what comes up and almost before I know it, the feelings pass. Until they come again. And if something sticks around a little longer – that’s ok because I know now that all feelings (well, everything) is temporary. So, friend, I wish you the merriest of Christmases. And if you find yourself feeling lonely or sad for whatever reason, I want you to know you aren’t alone. PS – If you know someone who would like this or other posts from TGBTS, please share. 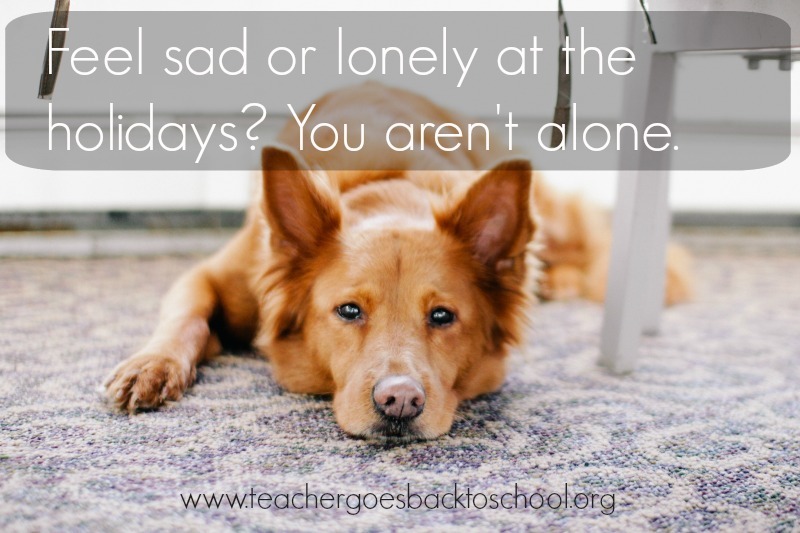 This entry was posted in A Yoga Story, Life as a Mama, Life At Home + The Neighborhood, Self-Care and tagged alone, community, depression, feelings, holidays, lonely, sad, temporary by Teacher Goes Back to School. Bookmark the permalink.